Few, if any, living alumni have seen the Baylor campus host a varsity football game. The last time the Bears took to the gridiron in an on-campus facility was 1935, the team's last of 29 seasons at Carroll Field, located where the Bill Daniel Student Center sits today. Those three decades (1902-25 and 1930-35) mark the only seasons in Baylor football's history in which the team's home field has been part of the university grounds. That will all change in 2014, when the Bears open Baylor Stadium at the intersection of Interstate 35 and the Brazos River. A confluence of events has led to this point: breaking ground on a $250-million, state-of-the-art facility that will, at long last, return Baylor football to the university campus. The Year of the Bear of 2011-12 will go down in history as perhaps the best year in Baylor athletic history. From Robert Griffin III's Heisman Trophy and the Bears' 10-win season, to the Lady Bears' 40-0 run and national championship, to men's basketball in the Elite Eight and all 19 varsity programs reaching the postseason for the first time, to say it was a year for the record books is an understatement. But when the year ended, Baylor leaders had a choice to make: to rest on well-deserved laurels, or to keep working toward an even brighter future. To accept all those achievements as the pinnacle for Baylor athletics, or as flags planted along the climb, notches tallied on the belt, part of Baylor's continued push into the upper echelon of college athletics. The decision was simple. In July 2012, Baylor's Board of Regents officially and unanimously approved the building of Baylor Stadium. "We absolutely had to capitalize on the excitement and momentum of this past season, because if we didn't do so now, I don't know when the next time the window would have been so open," says Director of Athletics Ian McCaw. "Every university has a lot of competing interests and priorities, but the momentum of football created interest that caused the stadium to happen at this particular moment. 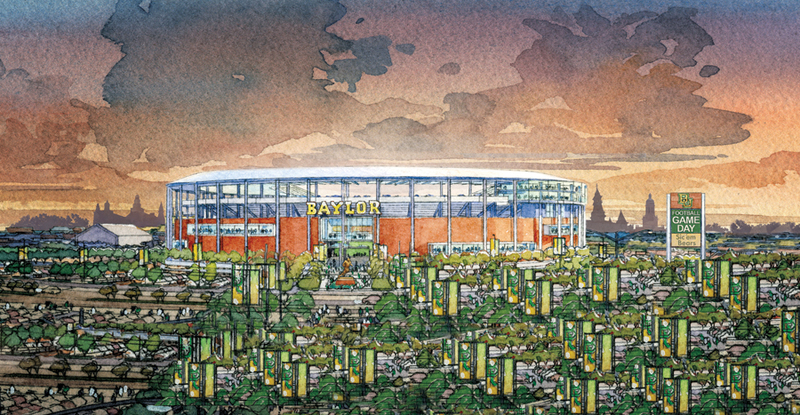 The concept of an on-campus football stadium has been talked about at Baylor for decades, but the success of this season and the leadership gifts from the Drayton and Elizabeth McLane family, John Eddie and Sheridan Williams, Sheila and Walter Umphrey and others moved it from a dream to a reality." Baylor's athletic success over the past year has turned more eyes than ever upon the university. The Bears set attendance records in football, men's and women's basketball and baseball. The 2011 Alamo Bowl was the most-watched non-BCS bowl game of the year, and the crowd of 65,526 was the fourth-largest among non-BCS games. University officials want to keep those eyes fixed on Baylor and see now as the time to build for the future -- literally. "We started looking at what to do with Floyd Casey Stadium probably two years ago," explains Dr. Reagan Ramsower, BBA '74, MS '76, Baylor's senior vice president for operations and chief financial officer. "It was our number-one deferred maintenance project. It's an old stadium, and once you start renovating something, it triggers a lot of the current accessibility laws and so forth. We estimated it was going to cost $80 million to really fix up Floyd Casey. "Then a couple of other things came along. We felt an urgency as a result of conference realignment, and then this year, as we moved through football season and continued to see excitement build, we realized that we could be successful in a fundraising campaign and get a new stadium, an on-campus stadium, done now." As continued athletic success through the winter and spring kept excitement levels high, other pieces also fell into place. After a couple of shaky summers in 2010 and 2011, the Big 12 Conference found itself not just secure but anchored as one of the premiere leagues in the country with word of an extended television contract in May 2012 that will quadruple the conference's previous revenue. That was followed just two weeks later with the announcement of a "Champions Bowl" pitting the Big 12 and Southeastern Conference champions against one another in an agreement that could bring the league as much as $100 million a year. "The TIF partners [McLennan County, Waco ISD, McLennan Community College and the City of Waco] are all supportive of this, and they all believe that it's better for the area to invest in the public access and public works of the stadium for the improved opportunities that will be available in the greater downtown area," says Waco Mayor Malcolm Duncan Jr.
Those funds, coupled with generous donations from the McLanes, Williams, Umphreys and others, topped the $100 million mark by summer's end, encouraging Baylor's Board of Regents to officially give the project the green light. Ramsower says the university will raise another $100 million through bonds, and fundraise the remaining costs from donations; no tuition dollars will be used for the stadium. "You look at the increased TV and bowl revenues, plus you look at the revenues that this stadium will create over and above what revenues we had from Floyd Casey, and those bonds over a 30-year amortization can be paid for based on athletic revenues," he says. After deciding to move ahead with a new stadium, the next step was deciding on its location. With eyes toward both exposure and fan experience, several sites were considered to the north and east of campus, but the final decision was made to build at the intersection of one of the nation's busiest roadways and the state's longest waterway. "The location will have a powerful impact on the Baylor brand," says McCaw. "Being adjacent to the river is a really unique feature. Our architects continue to talk about how rare that is and what an exceptional opportunity it is, with the beauty of the river and the bridge and connection to campus." Heinz Field, home of the NFL's Pittsburgh Steelers, is perhaps the best comparison to Baylor Stadium in this regard: open at one end, looking directly out over the water and across to the populated area (downtown Pittsburgh for the Steelers, the Baylor campus for the Bears). Another plus to the site is its visibility along Interstate 35. The stadium will stand taller than Clifton Robinson Tower, and obviously be much broader. Its location will provide a powerful representation of the Baylor name to the 42 million drivers who traverse I-35 through Waco each year. "For years, people have told me that they drove through Waco and didn't realize the university was right there along the highway," says McCaw. "We weren't immediately visible from I-35. "Now, when you drive through Waco, you're going to see -- up close -- a towering facility, with a beautiful façade and all the state-of-the-art amenities you can imagine. It will be truly unique in all of college athletics, to have a facility like that on a major interstate, adjacent to water and connected to a college campus." "We think of Baylor athletics as a front porch to the university," adds Ramsower, "but I think this stadium will also be a front porch to the riverfront and downtown Waco. "I came to Waco in the early 1970s, and for as long as I've been here, the river has always represented a great opportunity for city development. That's begun to happen in the last few years, but I think this project will be a big leap forward in that effort." 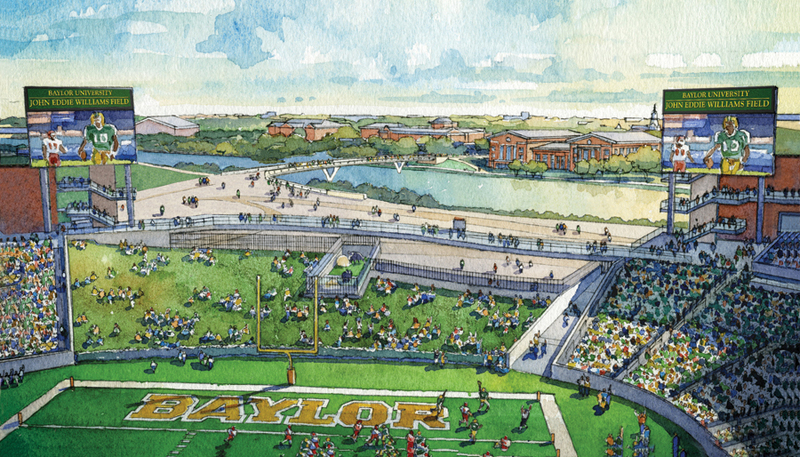 As the largest project in Central Texas history, Baylor Stadium is at the epicenter of a chain of initiatives aimed at revitalizing downtown Waco and developing the Brazos riverfront. In the mid 1990s, old warehouses downtown began to be converted into restaurants such as Ninfa's and Cricket's and shops like Spice Village. Over the last five years, new lofts have been built downtown to attract more residents to the area, and the Waco Convention Center completed a three-year, $17.5-million renovation in July 2012. Along the river, a new low-water dam was completed in 2007 that regulates the height of the Brazos River and makes it a much more attractive waterway. The riverwalk that previously ran from Cameron Park to the Texas Ranger Museum was expanded in 2010 to run the length of the Baylor campus, all the way to the Ferrell Center. Construction is underway on new I-35 access bridges across the river that will better handle traffic around campus and the stadium by 2014. "Many folks in the community worked for about 18 months on a master plan for downtown and the river corridor that we called Imagine Waco," says Ramsower. "That master plan always envisioned a catalytic project that would stimulate synergistic development. I think Baylor Stadium is that project." Such a large project will naturally generate spinoff effects that ripple across the local economy. In the short term, building the stadium means an influx of jobs. Dr. Ray Perryman, BS '74, a nationally recognized economist, projected that the construction alone will generate hundreds of millions of dollars in economic activity for the Waco area. "Going forward, our research indicates that the stadium will be a catalyst to additional development, enhance tourism opportunities, and promote the image and profile of the region," adds Perryman, who has previously worked on similar studies related to such facilities as Cowboys Stadium, American Airlines Center and Texas Motor Speedway. Perryman's study predicts an additional $20 million a year coming into the Waco economy over and above what Floyd Casey Stadium previously generated, plus a cumulative total of $22.8 billion in increased Waco business activity caused by the new stadium over the next 20 years. "Around this new facility, not only do you have the Baylor campus, but you have the restaurants and the shops and hotels that are in downtown Waco," says Ramsower. "Visitors can stay in downtown hotels, have breakfast and lunch downtown, visit the shops, then go down a beautiful riverwalk to the stadium. I think you'll really see downtown Waco bloom as we find the events spill over beyond the campus to downtown and the river. "I think that six or seven years from now, we'll see a variety of new restaurants opened up along the river," Ramsower continues. "We'll see new hotels that have opened on the river, and many other opportunities that leverage this project." "The future is wide open," echoes Mayor Duncan. "I think there are already plans for downtown riverfront development that could very much be enhanced by the completion of the stadium: restaurants, apartments, retail space, more entertainment venues. Both sides of the river could benefit from the completion of the stadium." Part of that draw comes from the fact that Baylor Stadium will be used for far more than six or seven football games a year. Lounges, club rooms and other spaces will be able to host groups ranging from 200 to 600 people for banquets, conferences and other such events, and the grounds themselves are well suited for outdoor uses. "We have the opportunity to literally create events or festivals that are Central Texas, that are Waco, where people are coming from all around to attend," says Ramsower. "We estimate that in the first year or two of the stadium, you could probably host 100 to 120 events a year, attracting 60,000 or 70,000 people outside of football." Both the City of Waco and Baylor stand to benefit from having a facility that can host such events. "We're both interested in improving the quality of life of the citizenry and the student body," says Duncan, adding that those in charge of the venue "will be charged with bringing events of a much wider variety into the area all during the year. I don't think we have that opportunity now; Extraco Events Center is pretty well booked up, so I think we'll have lots of opportunities for more entertainment and community events at this facility." Ramsower points to the University of Louisville's Papa John's Cardinal Stadium as an excellent example of what a stadium can be besides host to a football program. Concerts, band competitions and high school football games bring in thousands of spectators each, while smaller business meetings and trade shows can host anywhere from 50 to 1,000 visitors. Even the parking lots host driving events, training sessions and competitions. University officials believe that Baylor Stadium, its meeting rooms and the grounds outside could be used for a wide variety of activities. In future years, you might see the facility host a sports festival as part of the TriWaco triathlon. The community could create bigger, better Christmas or Fourth of July on the Brazos events, taking advantage of the new venue. High school or youth football games could be played on the nearby recreational fields. Texas Baptist gatherings like Congreso could meet in the stadium. "There are just so many opportunities, because Waco is centrally located in the state and can become a natural place to hold events," Ramsower says. "And if you think about the complex, you've got a stadium, a harbor, a river view, a river walk, and places to set up outside. There's a real need, a real opportunity, and real excitement in the community to do things down on the river." "I believe the stadium is going to be a great source of pride for the community, a great landmark," says McCaw. "Over the course of the last year, as Robert's had his accomplishments, and with women's basketball and all the other successes that have accrued, people are talking about Waco in very positive terms. I think this stadium will be one more large step in that direction, where it will be a great source of pride for Waco and Central Texas to have arguably the most modern, high-quality football facility in America right here in our community." The fans who come check out that new facility for a Baylor football game will also encounter a gameday experience like nothing they've seen in Waco. "For the first time ever, we're going to have a traditional college football experience on Saturday afternoon where alumni will actually come to campus instead of going to a stadium four miles away," says McCaw. "They'll come to campus, park, tailgate. There will be opportunities for functions in various university facilities. There will be student tailgate activities. There will be alumni activities. "And then there will be the experience of being part of a large group traveling together. I can envision the band marching over the bridge with the spirit squads in tow, part of a very festive, Baylor-rich experience as everyone goes over to the game with friends and family members. "We have the opportunity to build some really unique traditions, and to build on some existing traditions, that I think will be very special for Baylor Nation." Out-of-town fans will be encouraged to make not just a day, but an entire weekend, out of the trip to Waco for a game. "You don't have to look far to see other universities that have really learned how to create that three-day weekend, with the pageantry and all that goes on around the campus," says Ramsower. "We're creating an opportunity for people to come in on a Friday afternoon and not only be with other alumni but with the student body at the pep rally on campus, then to stay around campus and have that energy continue right on into gameday. They'll find programs and events happening on campus around game day. Then at game time, they'll be able to walk across the bridge to the game, and then afterward come back and be on campus that night to celebrate the victory. That's what it means to have an on-campus stadium." Once inside the stadium, the facility's design will ensure that fans will find a tighter, louder atmosphere than Floyd Casey Stadium could generate. "At Floyd Casey, much of the seating is quite distant from the field; this will be a much more intimate atmosphere," says McCaw. "Fans will feel like they're right on top of the game; players will feel like the fans are right on top of the game. I think that will be the biggest jump that fans will notice in terms of their overall experience -- they'll feel much closer to the game than they have before." As they have at Floyd Casey, students will still have the best seats in the house. In fact, these seats will be better. Student seating runs from end zone to end zone behind the visitors' bench, with the Baylor Line in the very best seats down along the field. "We've kind of modeled it after Duke basketball, and I think it's going to create one of the best student seating situations in the country," says McCaw. "Students bring so much energy and enthusiasm to the game, and we wanted to capitalize on that." Baylor Stadium is just one part of the university's future. The President's Scholarship Initiative continues to push toward its goal of raising $100 million for scholarships by next summer. Another residence hall, East Village, will open in August 2013 and house an additional 700 students. With continued philanthropic support, there is also discussion of a new business school campus. In Pro Futuris, university leaders assessed where Baylor University stands today and mapped out a vision for the next decade or more. Whether in athletics, academics, student life or any other area of the university, Baylor will continue to press ahead.